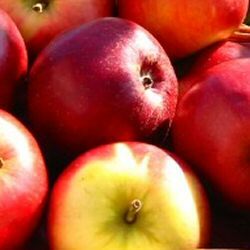 Bare Root Scrumptious Apple Tree Click the link for Containerised Scrumptious Apple Tree and more information. Won the RHS Award Of Garden Merit. Month of Picking: September and will store until October. This apple is in flowering period is C3 and will pollinate other apple trees in flowering periods C2,C3 and C4.